Enjoy the beautiful Mont Ste-Anne area all year-round. 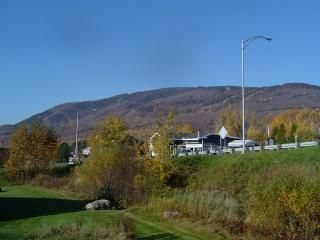 magnificent view of Mont-Ste-Anne, well known as the best ski station of eastern North America. Fully equiped, the house can accommodate up to 8 persons in beds. Also, cable TV, DVD player, WI-FI, linens and towels, washer and dryer, dishwasher, microwave, balcony, BBQ, ski locker and 2 parking spaces. Tennis court, Swimming pool, Gym, Ping-pong, Sauna. Skating rink, Horseback riding, country skiing, alpin ski, restaurants. Nice, well equipped property. Owner always responded quickly to emails. Wood burning fireplace was lovely to have at the end of a day of ski. About a 5 minute drive from the hill, with an excellent view of the hill. Nice touches such as board games, spices in the cupboard, etc. Nous avons adoré notre sejour a Quebec. Chalet tres bien equipé, convivial et vraiment bien situé pour les skieurs ! Condo bien equippe et tres bien situe. Condo-chalet tres bien equippe, tout y etait et est tres proche du ski alpin et de fond. Nous y retournerions pour sur. The condo was well-furnished and comfy, perfect for our week stay. We were there in the summer, and it's situated close to biking and hiking trails, and a quick 10 min drive puts you into the town of Beaupre. Lucille was very accommodating and provided us with easy check-in instructions. A full kitchen setup was nice for the days we cooked in, and there was a BBQ on the back deck. We'd definitely love to come stay there again! Thanks for your great comments Evelyn, it is really appreciated and be sure that I will be glad to welcome you again! WINTER 2019-2020:: CHRISTMAS FEES: 2150$ per week. 1995$ for 6 days. 375$ per day 5 days minimum and 3400$ for 2 consecutive weeks. RATES are fixed for 6 personnes and less. Over 6 personnes an additionnal fee of 20$ per day/person will be charged. 5 months 1950$ per month 4 months: 2350$ per month 3 months: 2250$ per month 2 months: 2500$ per month, 1 month: 2500$ except April: 2000$ 1 month: 2500$ per month, all included ( December or January or Febuary or March) 2000$ per month (April) DEPOSIT OF 500,00$ CAD THAT WILL BE REFUND AFTER THE INSPECTION Note: Until confirmed, rates are subject to change without notice.